Yet another owie Jack post! So me and the kids are all at the hall before the reception for the family photo we have been waiting for (me more excited then others). I'm taking some pics and asking Tay to watch Jack for a few, when I hear it, the blood curdling scream, I run to the bathroom where Tay is running in, and ask Tay, tell me he is ok. NOPE! Blood running down his face from his eye. Yup, a nice slice right above it. YOU HAVE GOT TO BE KIDDING ME! That is all I can think. Is it so bad I need to go to the ER??? All I know is it is bleeding like CRAZY! I finally get to see it, and it is a nice gash, but I'm thinking, butterfly bandages. Call gramma and ask her to bring some. Go out and ask if we can be the next family pic so I can deal with Jack, and before it swells too much! And beg him to PS the pics so you can't see it! lol Yes, this has to happen just minutes before our family photo! That is my Jack! I swear more food ends up on him, in his hair, and all over the floor (the best reason that a family with a toddler needs a dog, thanks Bailey) then in his tummy! So mac n cheese for lunch, and he gets it everywhere, all over his face, on his belly, on his arms, even on his legs!!! He sure enjoys eating, hehe! Well his teeth are pretty well healed, but still a lil wiggly. The white spot on the right is a new eye tooth poking through! Jack is doing so much better in his big boy bed! We put rails on the bottom bunk and that is Jack's bed, Cam gets the top. Cam had to camp out a few nights on the couch while Jack was figuring out this big boy bed thing, but last night, Cam hopped on the top bunk, told Cam good night, and laid in his big boy bed without a whimper or tear!!! Go Jack Go! I think he has it all figured out! No more nights sleeping by the door with a pillow and blanky! 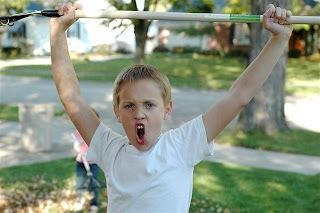 My yard warrior!!! Cam the man! 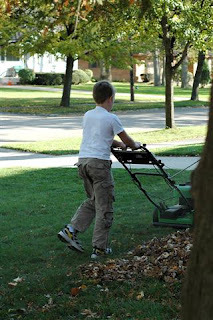 He was working hard this week for his allowance! 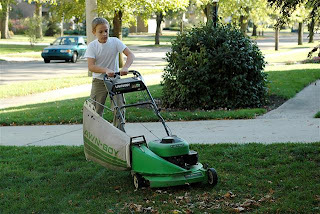 Raking leaves, mowing the lawn! I can't believe how old he is getting. Of course I am sure dad will enjoy having the help out there! 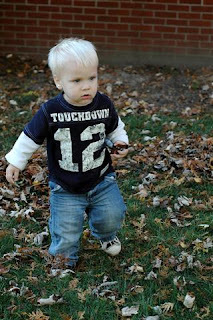 Well today is the 18 month old mark! We have made it this far, wheeewh! Jack is quite a dare devil, keeping up with him is hard. Day after day I tell him he is lucky he is so cute, and cute he is! I love my lil man! Here he is playing in the leaves last week, his first time for fall! He was having such a blast! Poor little guy knocked his 4 bottom teeth forward and fractured the bone underneath them. He saw a specialist this morn, she couldn't save one, but tried stitching the rest of them in, and she is hoping they will make it in there for a few years. No guarantees. He is miserable, I am miserable cause I feel so bad for him. Jack woke up around 1:30 am, he has had a cold, so I tried sitting with him and getting him back to sleep. Then I tried some Benadryl cause that is what the doc recommended to help him breathe and sleep. Well he kept fighting me, so I put him back in his crib around 2:15 am. Well he decided to jump out and follow me, and somehow hit those 4 bottom teeth. There was so much blood, he was covered, I was covered, I was freaking out, ran to my dh. I didn't want to put himm in his car seat and I was too freaked to drive, so I called 911. The doc said I did the right thing, even though I felt like an idiot. We just didn't know what was going on at that point. They x-rayed, no bones in his jaw or cheeks broken. They gave him some Tylenol with codeine and he got a little nap. Then we met with a pediatric dentist at 8am, she was super nice, did what she could. Apparently she had seen nothing like what he had done, so she had to take pictures. Poor baby was so sleepy that he fell asleep while she worked on him. I wasn't allowed in the room, which at that point I needed the break anyways. So Jack needs some good vibes to keep those lil teeth in there as long as he can, and not to fall for a few days at least and reinjure himself. I gave him more of that Tylenol with codeine and I'm hoping he gets a good nap today. He is very miserable. We are trying to feed him things cut into small pieces like watermelon and peaches, and he seems to do ok with it. Oh and of course ice cream, he had that for breakfast. The tylenol seems to help, but you can only use it so much, or risk a tummy ache, and we don't want that on top of his teeth thing. So they told me to rotate Motrin, which doesn't seem to help as much, but guess it is better then nothing. I'm afraid to even let him down today, so we've been holding him, we went walking around Target cause it is kinda chilly out. But I think after dinner I'm bundling him up and going for a long walk. Sorry no pics. I swear I almost puked a few times, to a point where I was in the hospital bathroom holding Jack in one arm and my hair with the other hand. It was just that gross and painful looking. Now it is still gross with all the stitches and it is really swollen, but not as gross as earlier. I don't know if I even want a scrap page of this, what a mess. Of course the dentist did give us his first tooth, so maybe when it is healed I'll think about a pic. I just can't stop crying, I feel so stinkin bad for him and it is like there is nothing I can do for him. Last night me and dh were afraid to put him in his crib (which is now officially a toddler bed), we are being very overprotective while his mouth heals. He finally fell asleep on dh in the recliner at around 9:30, then woke up crying for me around 3, I gave him some of the Tylenol, and he fell asleep on me till 6:45, of course wiggling a lot, but he never really woke up. He is a new man this morn, in good spirits. I did give him a little Motrin just in case, it still looks so painful. Ok, now we are going to read a book together, he is waiting patiently lol! So Jack is getting a good nap today, my MIL stopped by and she has been gone for almost a 2 hour walk!!! lol! That woman has some energy! Ella is at school so I got a nice half hour nap, that is about all I can take for naps, short ones, no clue why! I just want to say what an amazing dentist that worked on Jack. I was very, very upset today, Jack didn't want to nap, so dh took him for a nice car ride to fall asleep so I could nap. Well I woke up, I was in tears, getting ready to call the dentist because we were out of the Tylenol and that seemed to be helping a lot, and you can tell poor Jack is in a lot of pain. Well I am going to reach to get her number and my phone rings. It is the dentist, she said she was worried about Jack and wanted an update. Wants to know how loose his teeth are, I'm sooo not going to try to find out, anything touches them and he is in hysterics. I don't want to try to wiggle them. Then I told her about being able to tell he was in pain, she asked for the pharmacy to call in more meds. Whewh! I was hoping she would be understanding. The Motrin is just not cutting it for the poor baby. So after another long rough day for Jack, he is out. I have him on my living room floor for now, I'm going to sleep on the couch so I can keep an eye on him. Right now he is terrified of his crib, well toddler bed, the crib rail is off and it has little rails to prevent rolling. I'm hoping he gets a good nights sleep, he so needs it. Thanks everyone for being so understanding. I deal with the 2 oldest's medical issues every day. You would think I would be able to handle this kind of stuff, but I feel like such a wimp. Well we are down to 2. Yesterday around 1 pm, Jack threw a fit, and somewhere in the fit, one of his teeth popped out. I try so hard to restrain him, but can you believe I am not strong enough? Normally I would let him scream it out, but we are trying so hard to protect his teeth. Luckily the dentist said she could meet us in 20 minutes at her office. She said it was too loose and had to pull it, UGH! But the other 2 seem to be tightening and staying, which is a really good thing. 2 out of 4 isn't too bad. Now today some of the stitches came loose, UGH! We do have a check up at 12:30 today, so I'll see what they say. I'm thinking of packing the kids and just walking the mall until then, keeps Jack out of trouble! 12:30 check up. Well apparently where the tooth was pulled yesterday it wasn't healing right. The bone was loose, so she had to put in more stitches, OUCH! My poor baby sees that dentist chair and flips. It took me holding him on my lap, a nurse holding his feet, another holding his hands, and the dentist trying to hold his head and look. He is miserable. I took him for a short drive, he fell asleep, he is in the car in the garage, I can hear him when he wakes in the house. Thank goodness for garages, cause there is no way I could just leave him in the driveway like that. So he is getting a good nap, and I got a 20 minute one. The 2 middle teeth are still in there, but wobbly a bit, she still doesn't know if it is going to work. For people that don't know, I sure didn't baby teeth do have roots, very long roots. Longer then the tooth itself, he ripped them down past the roots, into the bone below it. Graphic gross I know. Sorry. Why does it seem like so much longer? Lack of sleep maybe? Things are healing. He seems to be in a little better spirits each day. The stitches keep coming loose, I may have to go get it looked at tomorrow, UGH! He really doesn't like it at the office and freaks, screams, cries each time we go in. And I don't blame him, it just looks painful. The boy can not stop falling, typical for him, and it doesn't even seem like he has to bump the area lightly and it is bleeding like crazy. Still don't know if the two teeth will stay, and I don't know when I will know.